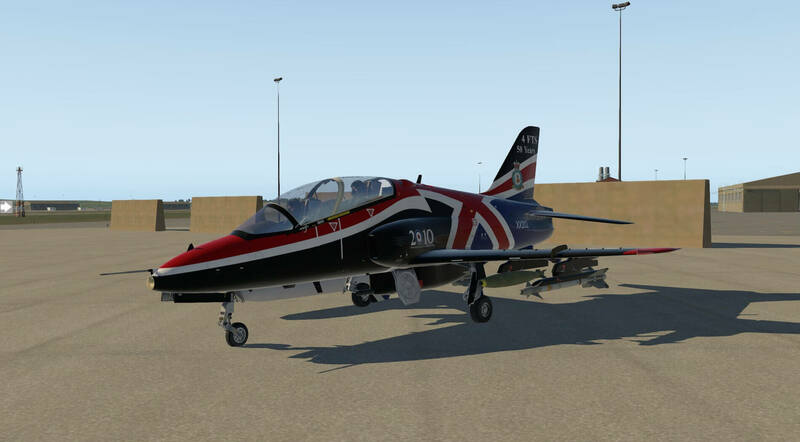 Information provided by Wikipedia states that the BAE Systems Hawk is a British single-engine, jet-powered advanced trainer aircraft. It was first flown at Dunsfold, Surrey, in 1974 as the Hawker Siddeley Hawk, and subsequently produced by its successor companies, British Aerospace and BAE Systems, respectively. It has been used in a training capacity and as a low-cost combat aircraft. 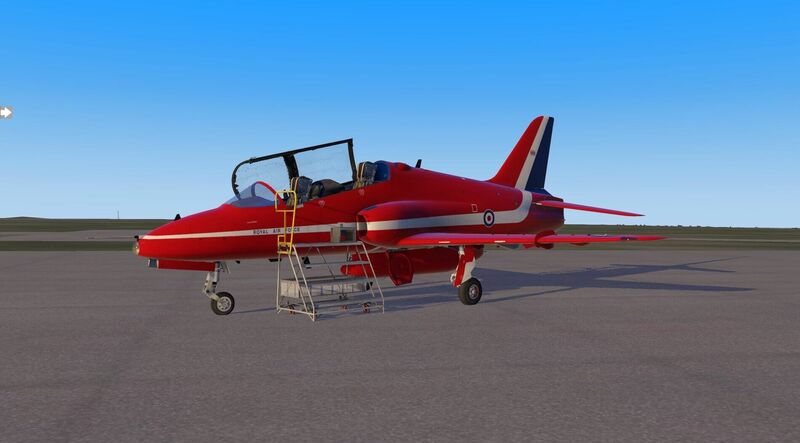 The Hawk is an advanced trainer with a two-man tandem cockpit, a low-mounted cantilever wing and is powered by a single turbofan engine. 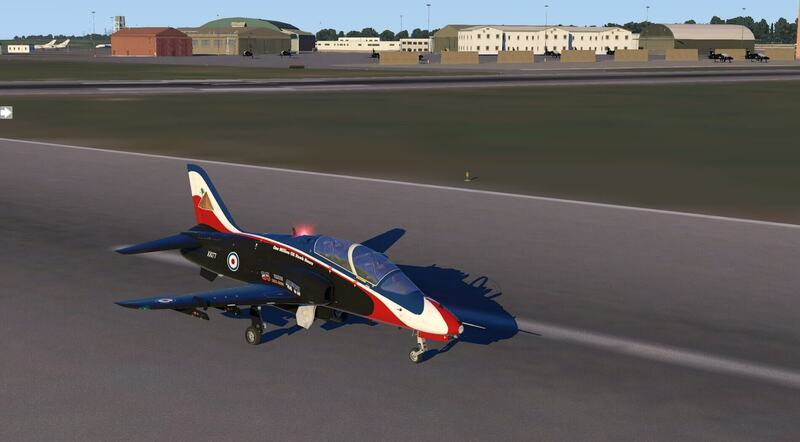 Unlike many of the previous trainers in RAF service, the Hawk was specifically designed for training. 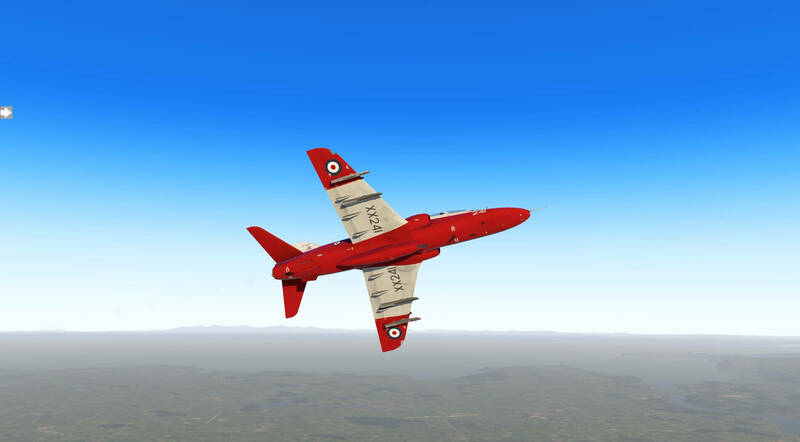 Hawker had developed the aircraft to have a high level of serviceability, as well as lower purchasing and operating costs than previous trainers like the Jet Provost. 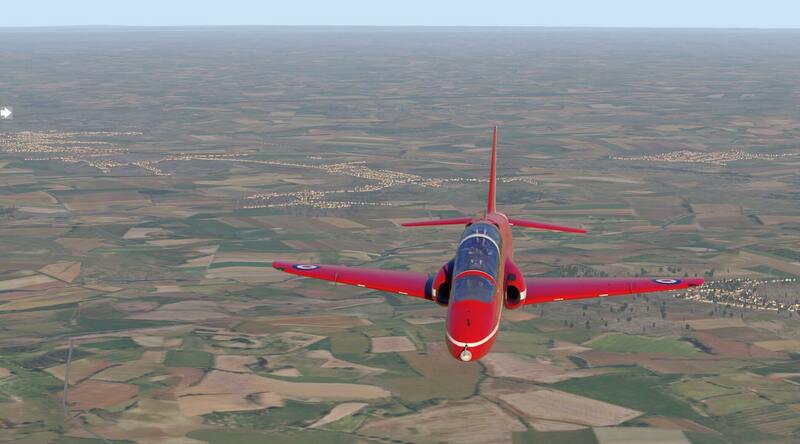 The Hawk has been praised by pilots for its agility, in particular its roll and turn handling. The design of the fuselage included a height differential between the two seats of the cockpit; this provided generous levels of visibility for the instructor in the rear seat. Each cockpit is fitted with a Martin-Baker Mk10B zero-zero rocket-assisted ejection seat. Air is fed to the aircraft’s rear-mounted Rolls-Royce Turbomeca Adour engine via intakes on each of the forward wing roots. During the aircraft’s development, Hawker had worked closely with Rolls-Royce to reduce the engine’s fuel consumption and to ensure a high level of reliability. 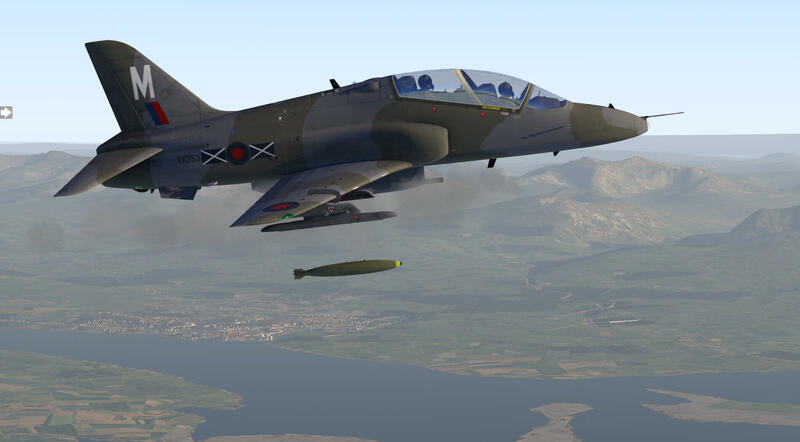 The Hawk T1 (Trainer Mark 1) was the original version of the Hawk used by the RAF, deliveries commencing in November 1976. 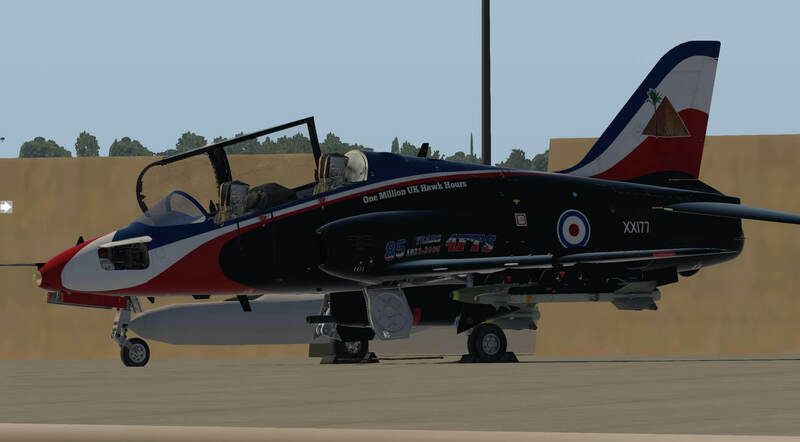 The RAF received a total of 175 T1s. 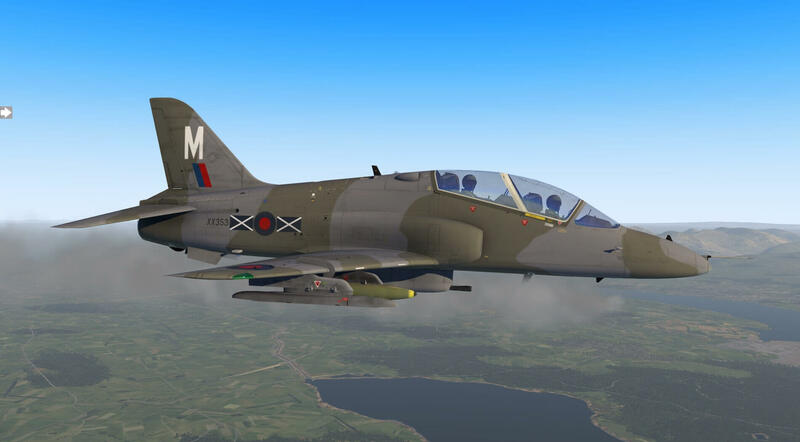 The Hawk T1A is a modified Hawk T1, intended to replace the Hawker Hunter in the RAF’s Tactical Weapons Units. 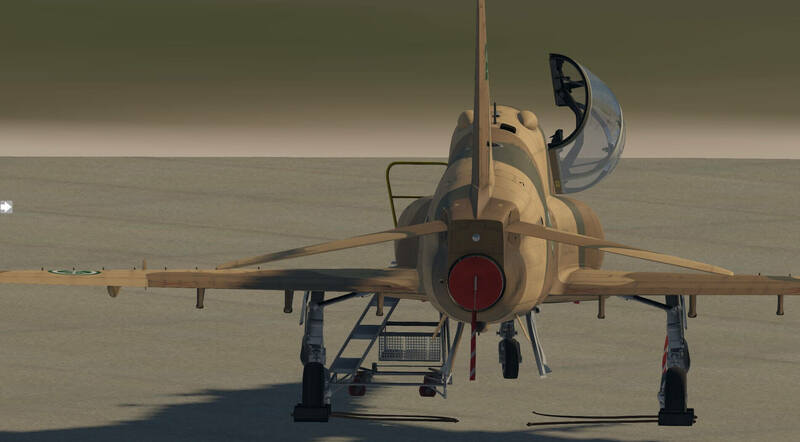 A total of 89 aircraft were converted to carry two underwing AIM-9L Sidewinder air-to-air missiles and a centreline Aden gun pod. Further information is also provided in the user manual supplied with the model. 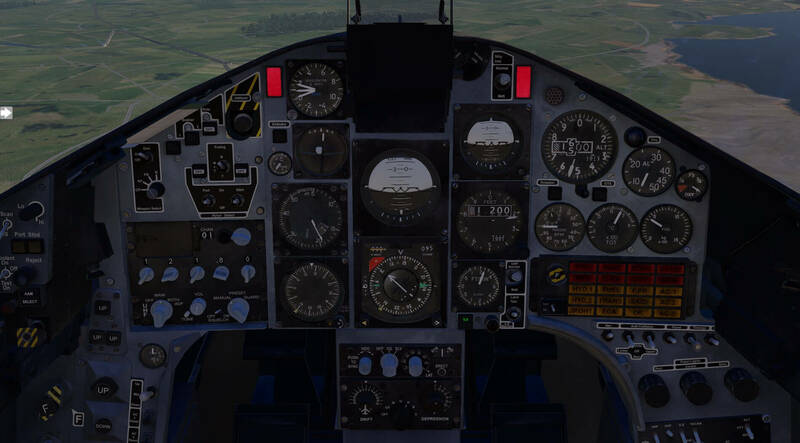 Download speeds will vary with the internet connection but the model is straight forward to download and can be immediately installed in the users aircraft folder. Once the aircraft is launched a serial number included with the download has to be completed in a box provided and the aircraft needs to reloaded before use. A simple process which is easy to complete and easy to follow. The downloaded folder contains twenty items including the Documentation folder. 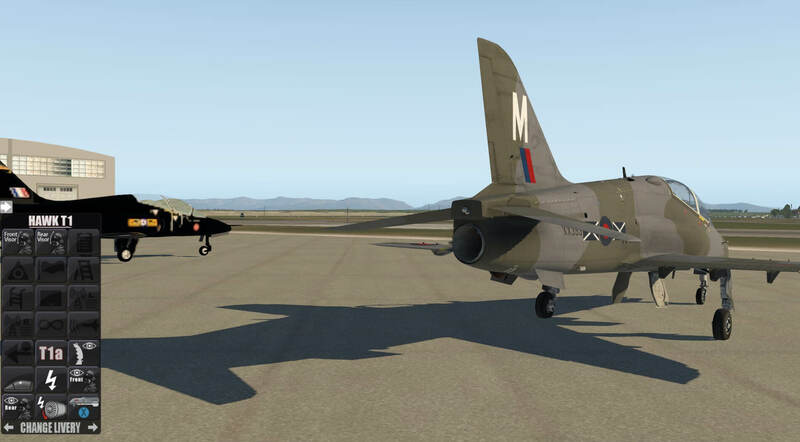 Some liveries are described differently in the flight configuration drop down menu from these lists and whilst most are easy to find one or two take a bit of working out. This could be described as part of the interest as it means studying the liveries closely and therefore appreciating the detail and does not detract from the use of the aircraft. The documentation folder contains three items. 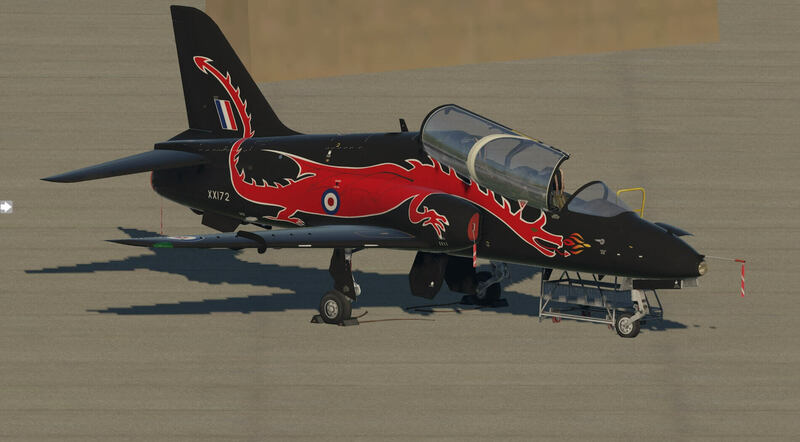 The first is a folder containing the Hawk paint kit and the second is an rtf outlining the version history of the model. The third item is a comprehensive, ninety-three page, operations manual. The developers have clearly put in a large amount of effort to make this a useful manual for users of all levels and experience. The manual includes an initial introduction giving a description of various aspects of the aircraft such as the cockpits, systems and paint schemes. 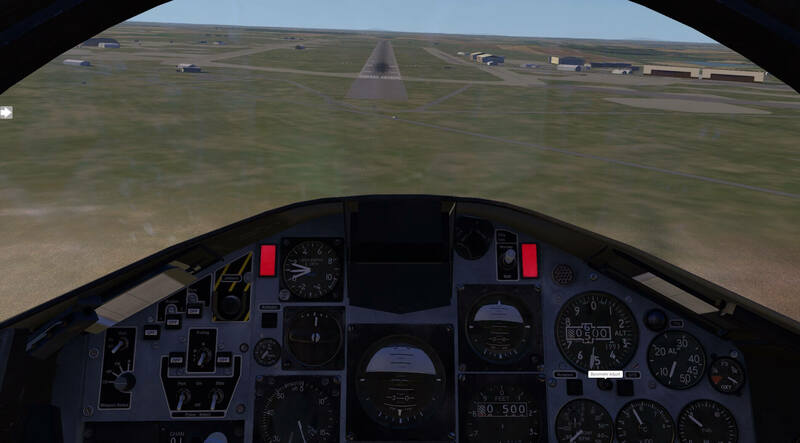 The second section covers installation and updates and the recommended settings for the model in X-Plane. 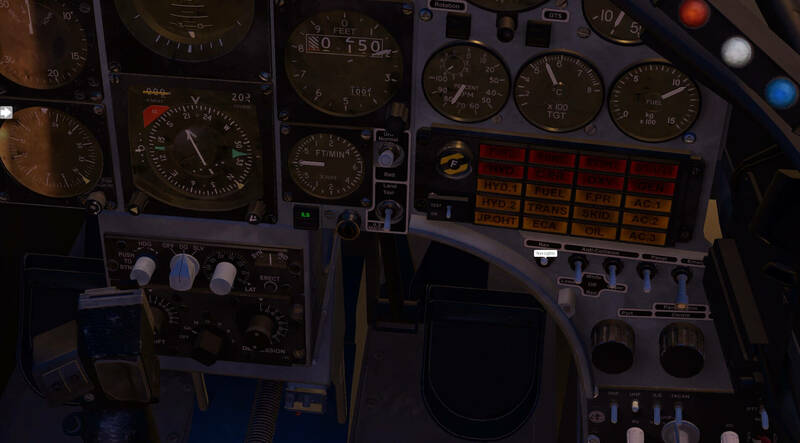 The following section is a panel guide with annotated screen shots of the various panels in the aircraft to assist identification and location of switches, dials and levers. 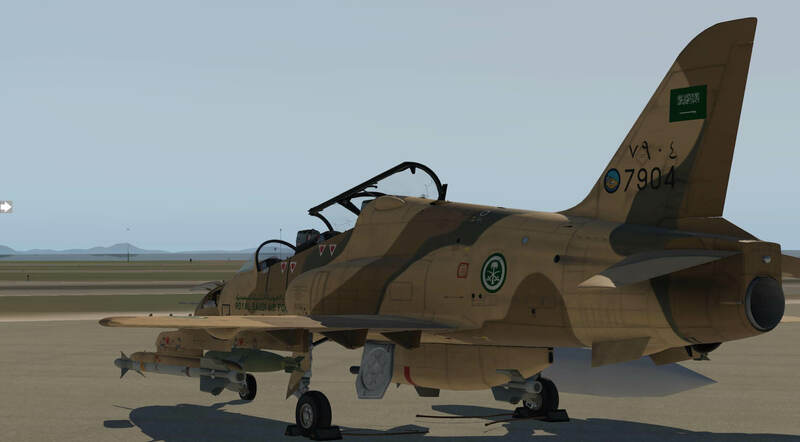 This section also covers the use of the panel selector which configures various options in the model such as pilots visors, checklists, canopy position, access ladders, weapons, radio frequencies and external hatches. The manual then gives an in-depth description of each of the aircraft systems, what failures may occur and the procedures associated with them. These descriptions allow a user to go into greater and greater depth with the model and develop a high level of knowledge of all aspects of the model, either involving all of the systems or one at a time. This creates enormous potential for the model to be used as a challenge, and indeed a trainer, for all levels of experience. Once the systems have been described the manual takes the user through a demonstration flight, which I will carry out later in this review, to build familiarity with the use of the model and to demonstrate how it works. 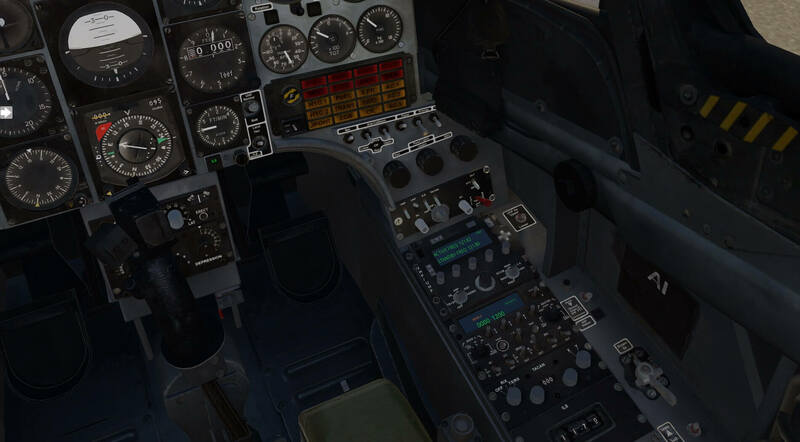 The tutorial focusses on the essential systems on board and does not go in to all the systems in depth but enough for the user to fly the aircraft realistically. The manual finishes with credits, highlighting the joint venture between Just Flight and Thandra, and copyright information. This is a well thought out, user friendly and helpful manual. 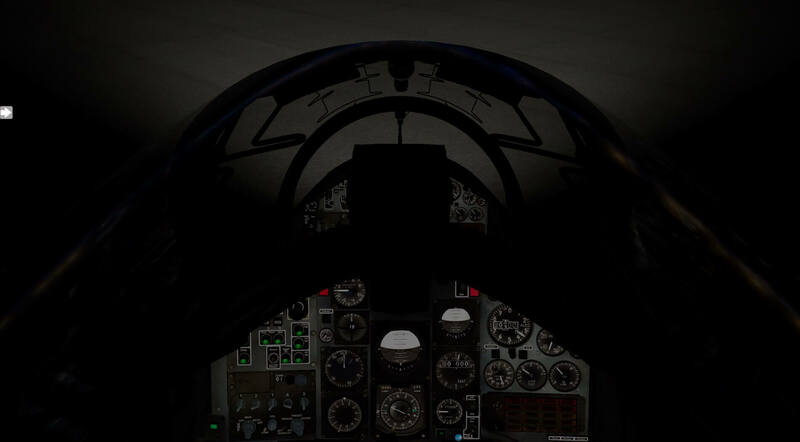 Approaching the aircraft in the cold dark condition on the airfield apron the detail of the aircraft is immediately apparent and the convenience of the on screen panel selector to set up the model as required can be appreciated. 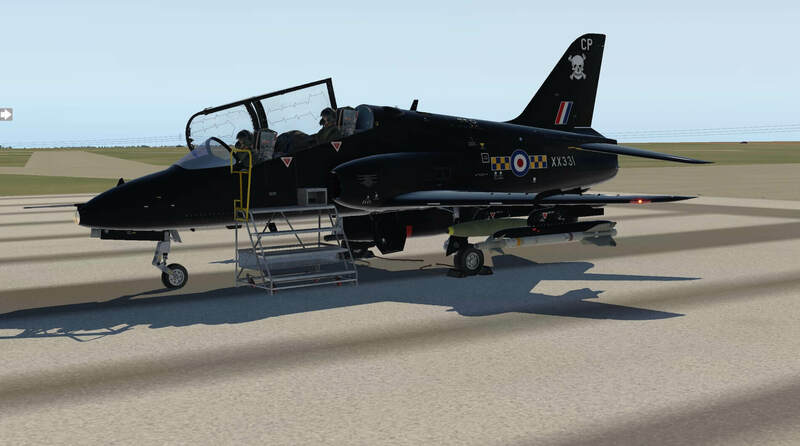 I initially set up the aircraft as empty of aircrew, canopy open and with service steps alongside. Colours are very vivid and in just the right tone to be realistic and bright. Textures, reflections and light all play a part to give the model an impressive appearance. Moving closer the labelling and markings on the aircraft are clear and legible, the canopy detonation chord is accurately modelled and colours change with shadow and light. 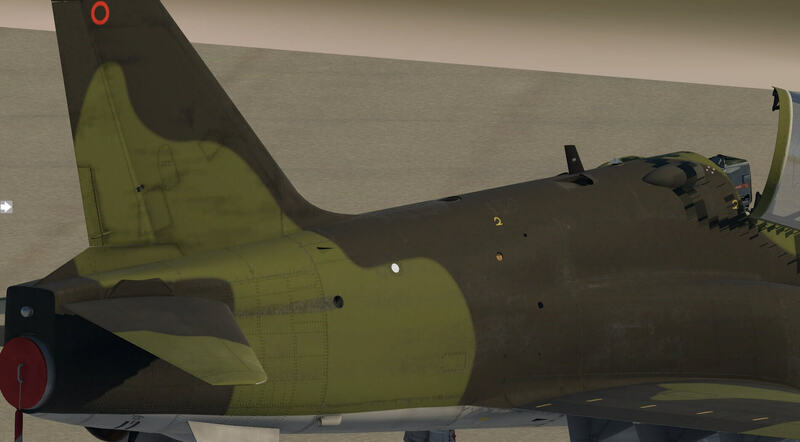 Rivets are modelled separately and the weathering on the aircraft adds to the effect. Checking the undercarriage this is modelled in detail with the tyre shape changing with load and the struts and mechanisms easy to see. The glass on the nose light is also modelled with great attention to detail. When seen from the front the detail can be appreciated further. The undercarriage piping is present and the colours and weathering on the wings works to great effect. 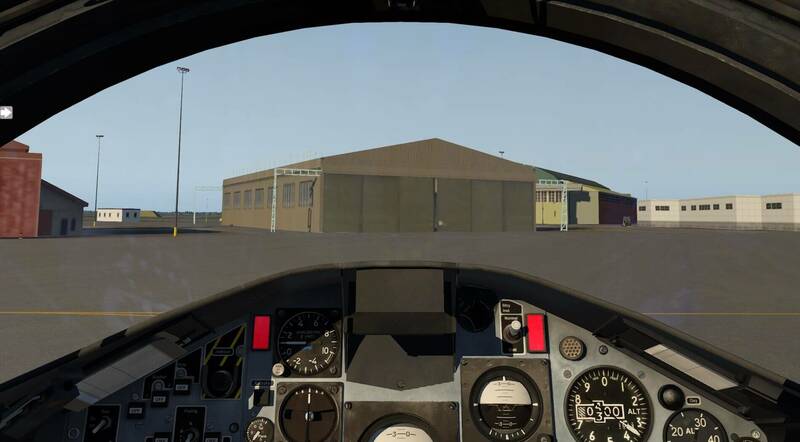 Reflections are of high quality as is the cockpit detail when viewed from outside. The canopy glass creates a different view again and the modelling of lights and surface detail are very good. Changing livery is made straight forward with the option at the bottom of the panel selector and whatever colour scheme is used the model appears very realistic with the light reacting well with all colours. 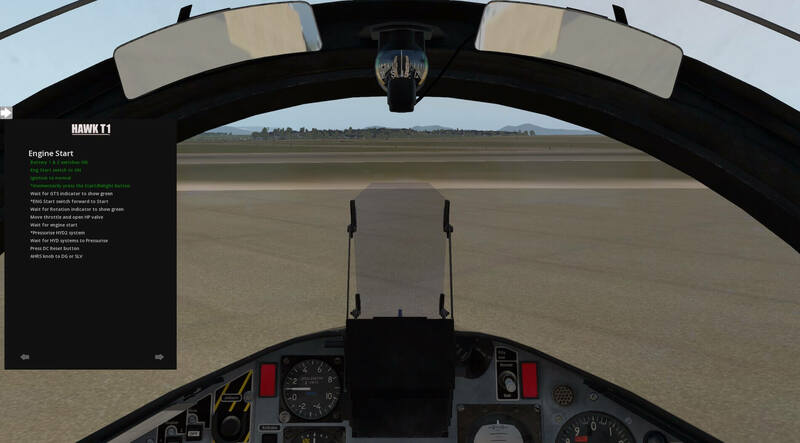 The view from the front right side of the aircraft shows the canopy in more detail and gives an opportunity to view the glass effect. Labelling and markings remain very clear and tyres have lighter colours where the wear marks exist. When chosen from the panel selector the engine covers and remove before flight flags are visible. 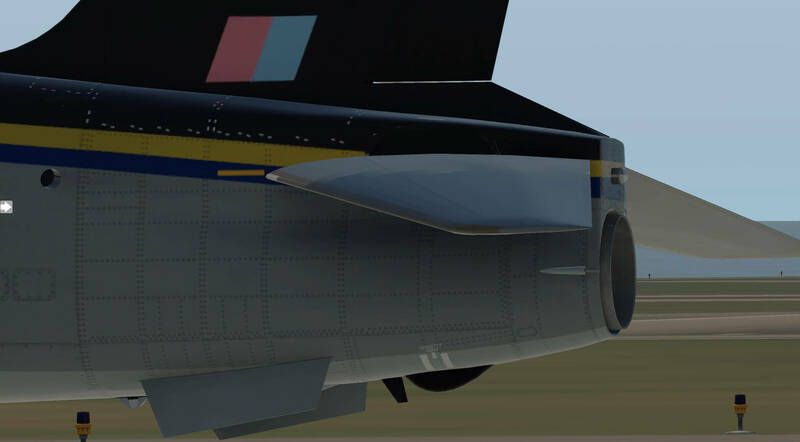 When viewed from the right of the aircraft the panel work and rivet detail is more evident and this is also affected by different liveries creating contrast between the aircraft surface and panel joints. When viewed more directly the reflection and transparency of the canopy changes and again the undercarriage detail is clear to see. Moving to the right rear of the aircraft the view provides further evidence of the attention to detail the developers have used in panelling and colours. Wear and weathering marks are modelled and the detail on the interior of the undercarriage doors is created very accurately. 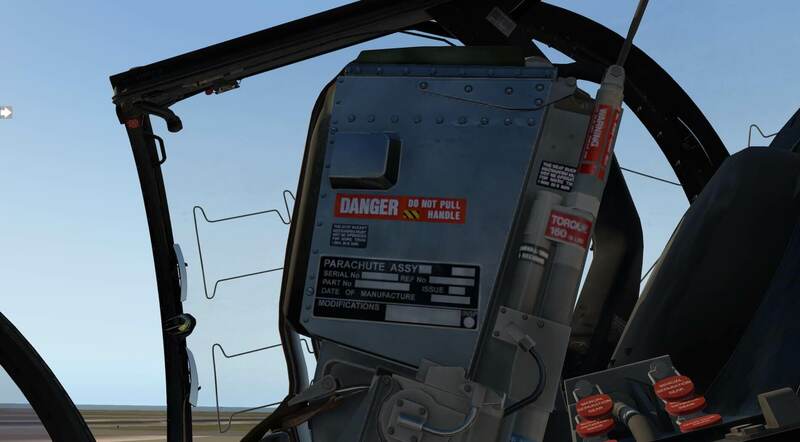 When viewed from the rear of the aircraft the model shows the attention to detail shown on panels, control surfaces and additional equipment and the model certainly creates a presence of a modern military aircraft with caution and warning notices, filler caps, aerials and panels all evident. 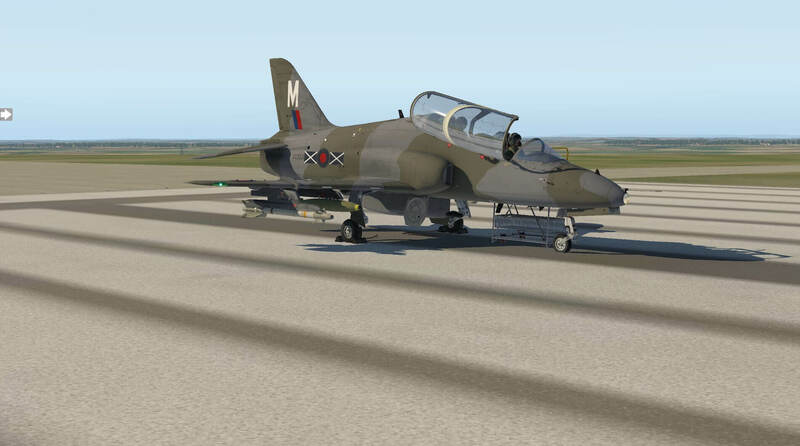 The model will also carry the X-Plane weapons and exterior equipment and when used these appear very realistically and the colour scheme also works well with them. 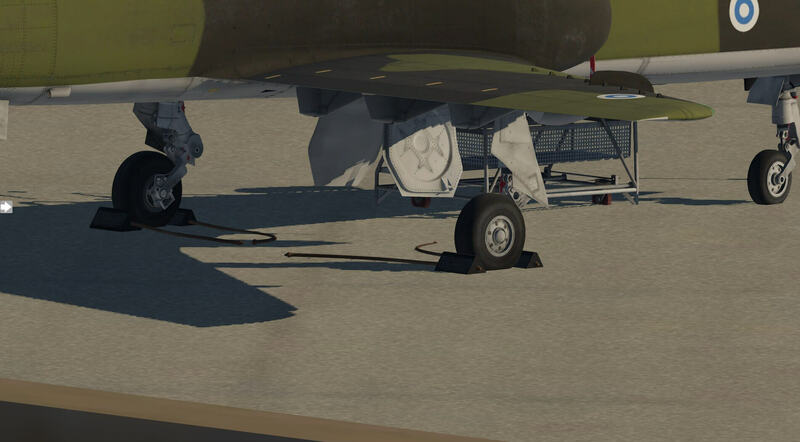 The aircraft suspension and stance on the undercarriage alter with the additional weight. When viewed from the left side the aircraft is very impressive. The weaponry continues to fit very well with the model and panel work, labelling and colours maintain their integrity at all levels of zoom. 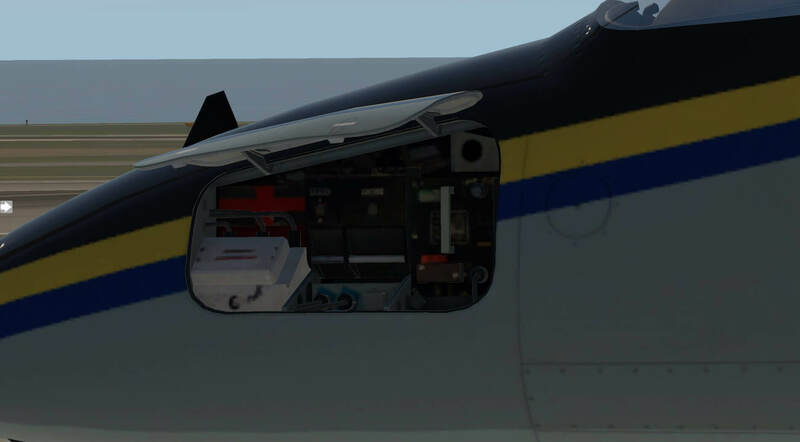 The panel selector allows for the front left storage hatch to be opened and the interior of the aircraft can be seen from this area. 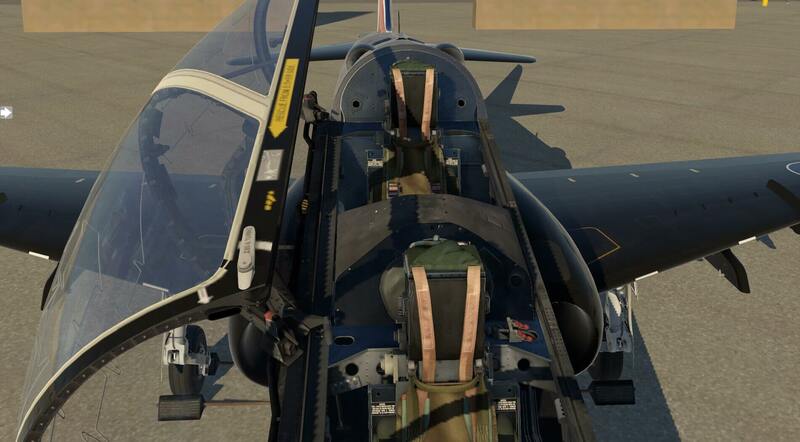 The labels and detail at the top of the ejector seats can be viewed from outside of the aircraft. Returning to the front left of the aircraft the detail and equipment continues to impress. Having done the walk around ground check it is time to enter the aircraft and turn engines on. A further check around the model shows two aircrew figures which move independently. 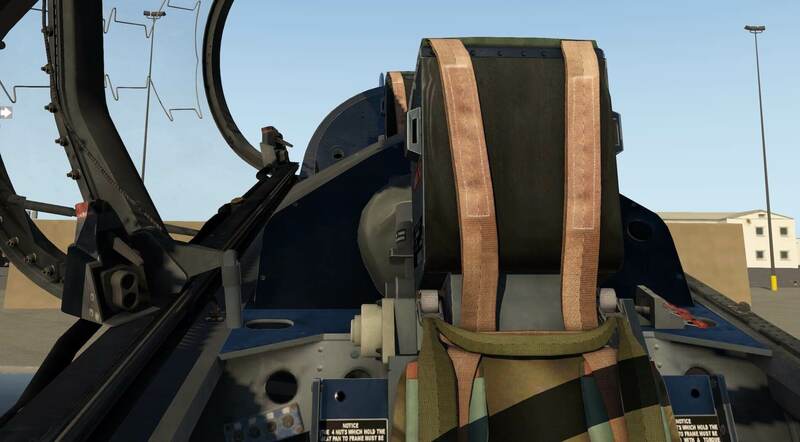 The selector panel allows for the sun visors on both aircrew to be opened and closed and when closing the pilots sun visor the overall view is dimmed as if looking through the visor itself. 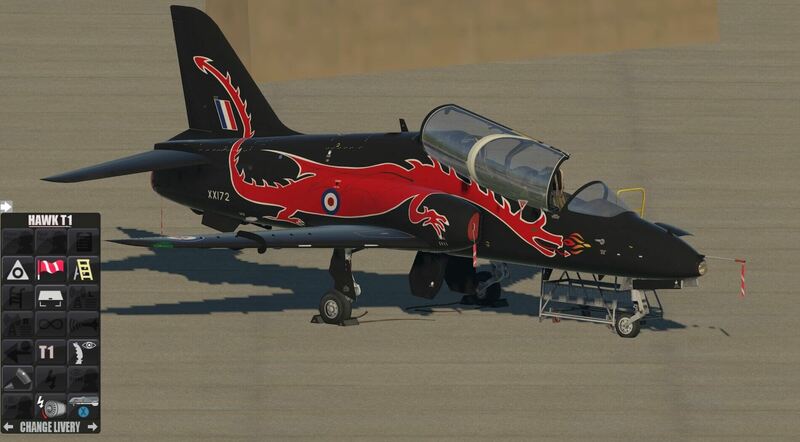 As the Hawk can be flown with one or two aircrew the panel also gives the option of choosing either one, or both, of the figures to be modelled. Moving around the model the heat effect of the exhaust is modelled and the control surfaces move smoothly and logically. 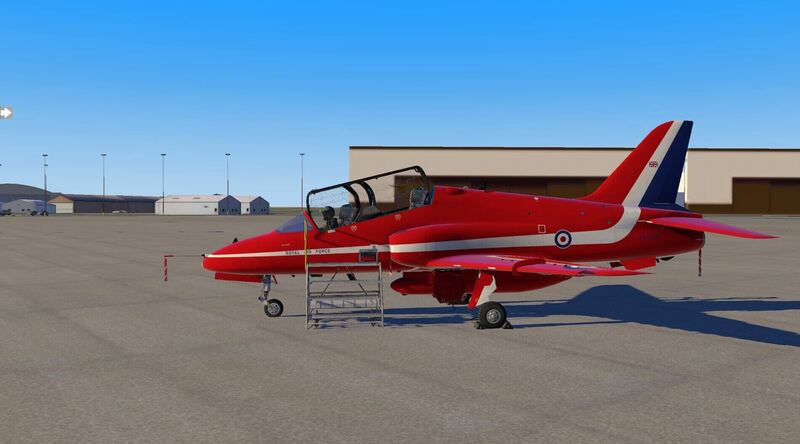 The details of the appearance of the model in the sales information relate to an accurately modelled aircraft with numerous animations and ground equipment. 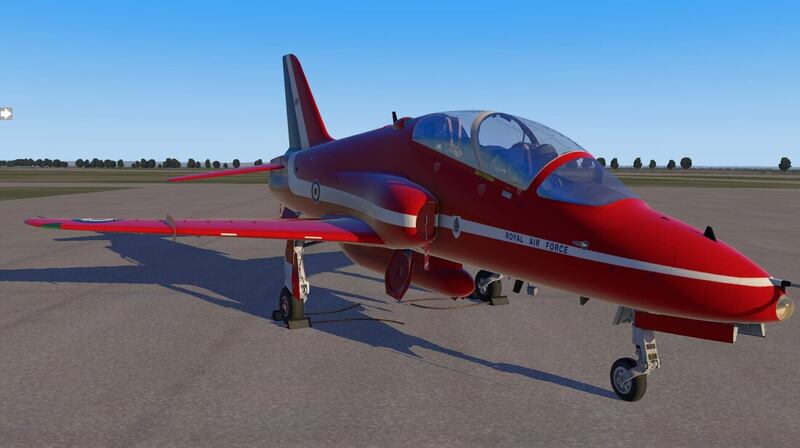 The textures and rendering are said to provide quality and realism with precise aircraft features. Although I did not manage to create the correct conditions, on the ground, to animate the ram air turbine, the examination of the outside of the aircraft certainly met the information provided. The aircraft looks impressive in any livery and from all angles. Moving in to the aircraft the quality and presentation of the interior has much to live up to to be a proper compliment to the exterior of the model. 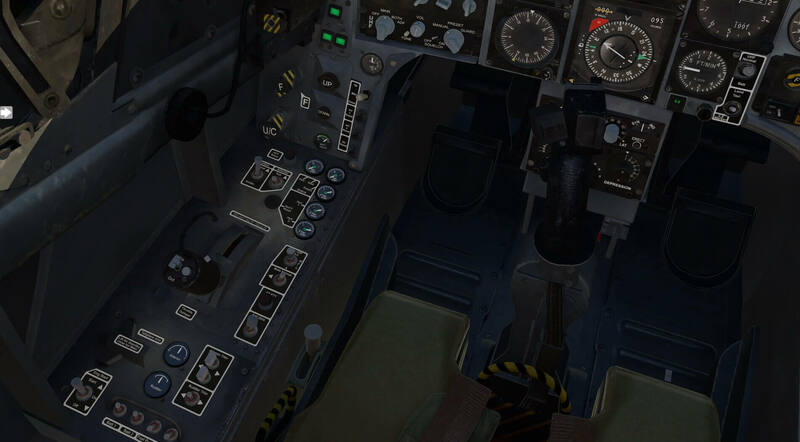 Looking in from the pilots steps the attention to detail is immediately apparent with the textures and colours of the interior making the inside of the aircraft look extremely authentic. 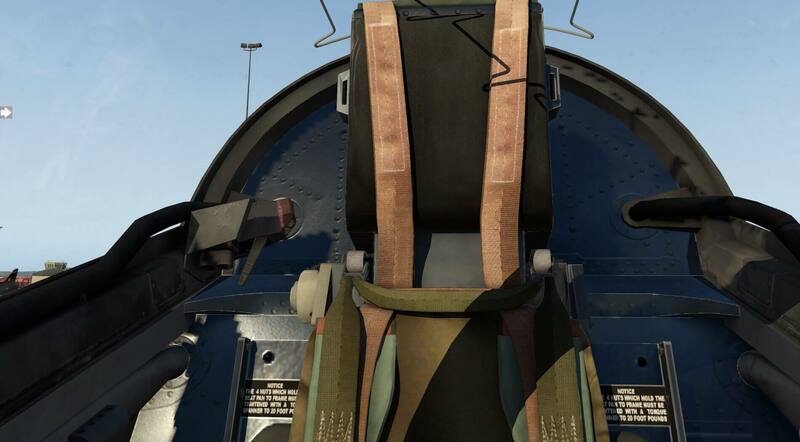 Wear marks are modelled to just the correct level and each different material used in the cockpit is modelled slightly differently from the last. 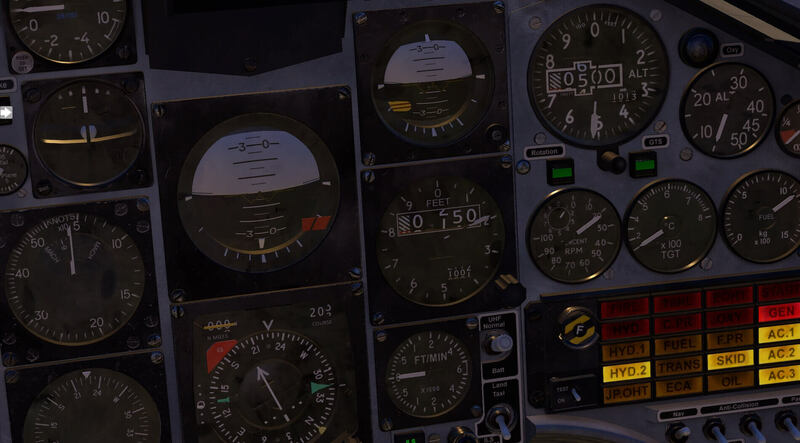 Dials, instruments and signage are all clear and legible at all levels of zoom and light and reflections react as would be expected. Opening and closing the canopy also subtly changes the light in the cockpit and when open the canopy itself displays lots of detail. The seats in both the front and rear positions have a large amount of detail and these really do show the efforts made to display each texture differently and as realistically as possible. Both positions have been fully modelled with all switches and controls modelled with their own movements which are smooth and realistic. I could not find a quick method of moving from one position to another so I set up a Hawk setting for joystick and keyboard configuration, positioned myself in the back seat then held down the control key and pressed one of the numbers on the numeric pad on the keyboard. 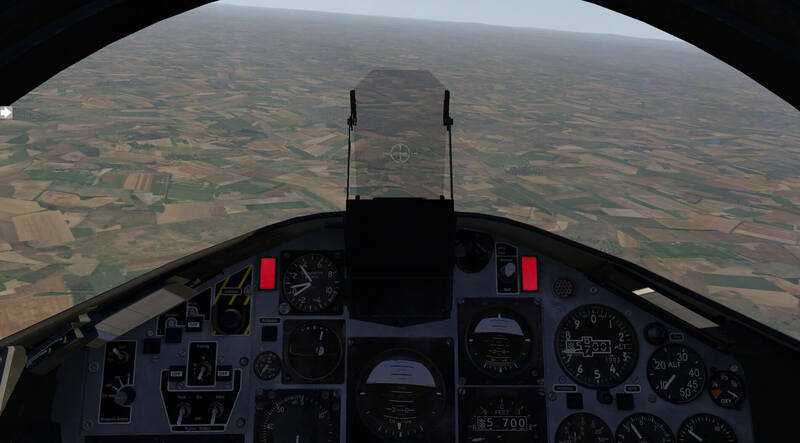 X-plane controls allow that when pressed this numeric key moves the view to the position set. All numeric keys can be used so moving around any model quickly can be set up. This arrangement allowed me to move from one cockpit to the other quickly. 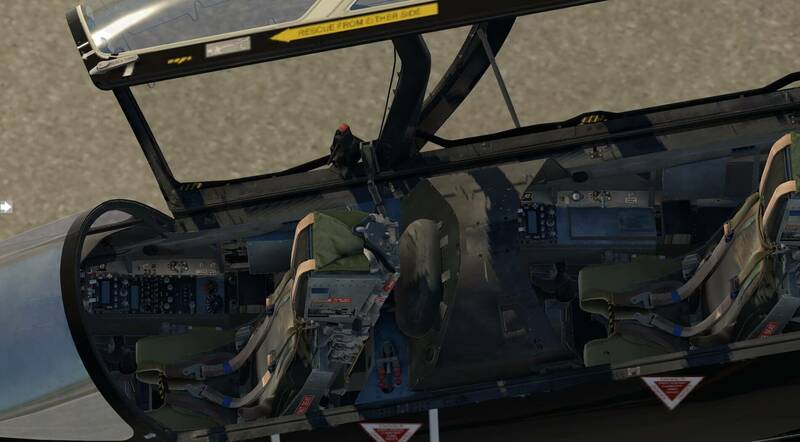 The rear cockpit has been given just as much attention as the default front position. 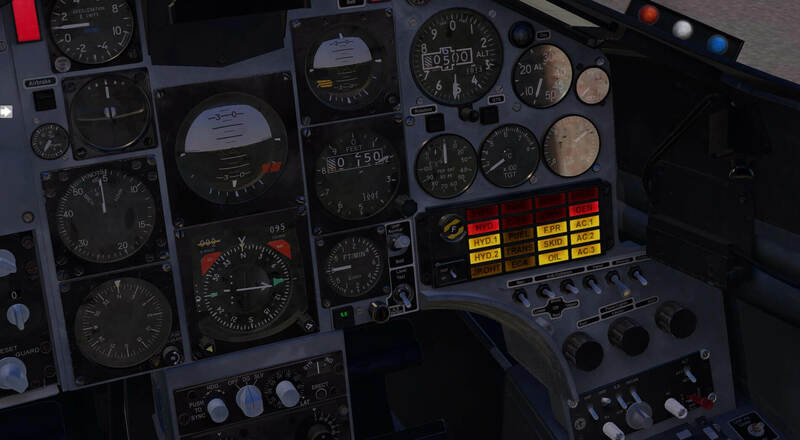 The avionics kit is closely modelled and the TACAN system can be programmed using preset numbers that correspond to radio settings, provided in a table in the manual. The selector panel enables the left and right frequency display panels to be toggled, the joystick to be hidden and the head up display to be switched on and off. This does allow quicker and easier use of these functions. The internal mirrors can be moved as can the left and right frequency cards. The selector panel allows the interactive checklist to be displayed. This provides lists for every stage of flight and each item can be checked off, and turned green, with a click of the mouse. The cockpits remain high quality once light fades, and the panel lights are required the instrumentation and interior looks great whether viewed from the front or back seats. The detail remains clear and visible. 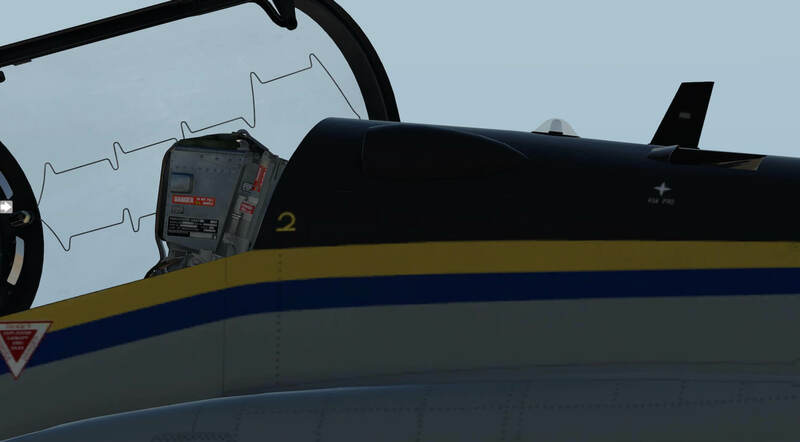 The information produced for the model states the aircraft has a 3D cockpit with all instruments using animation. 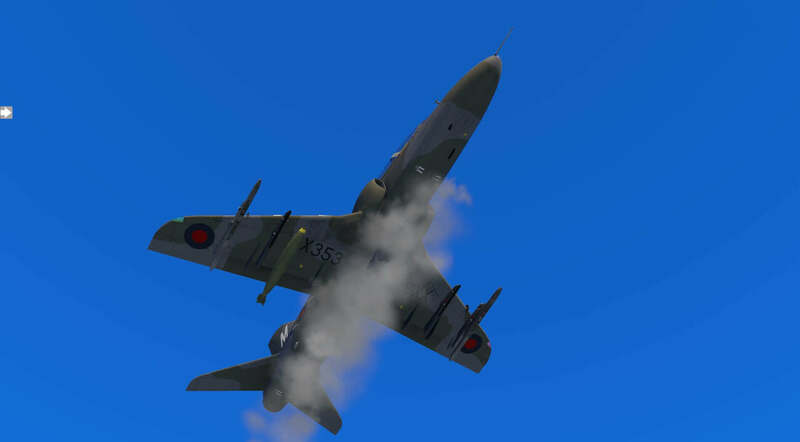 The information states that the modelling was taken from photographs of real aircraft and it is clear every effort has been made to recreate this as accurately as possible. 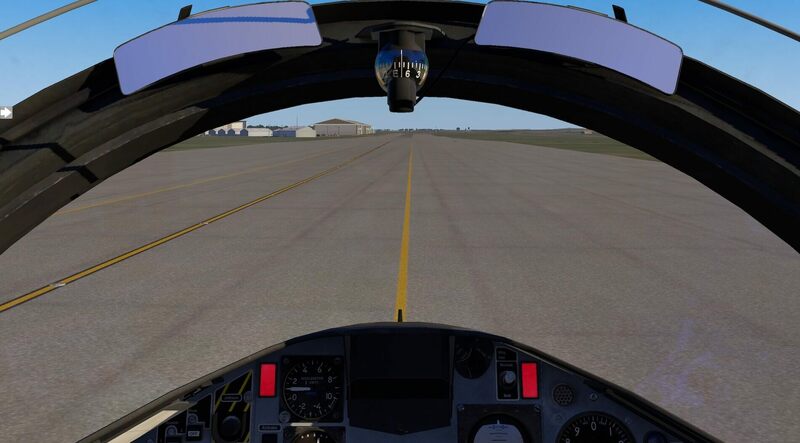 The result is a very convincing and realistic experience when viewing the aircraft from the inside which allows the user to become totally immersed in the experience. The model has a convincing sound package. Switches, warnings and controls have their own sounds and the canopy sounds correspond to opening and closing. 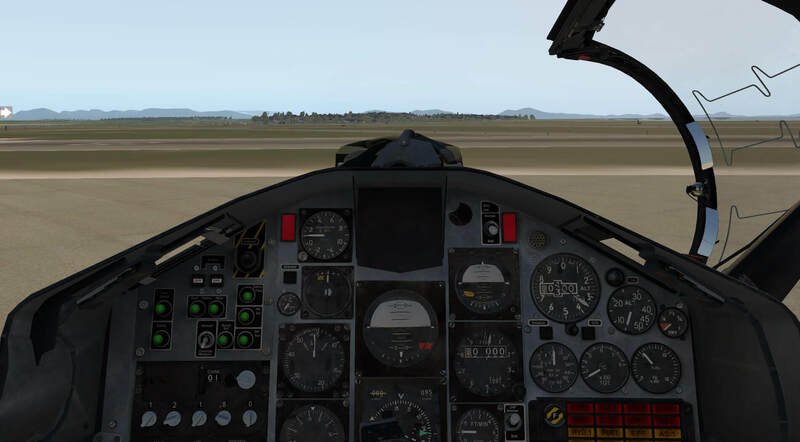 Engine noise and tone respond to throttle changes and ground and landing noise create a realistic experience. 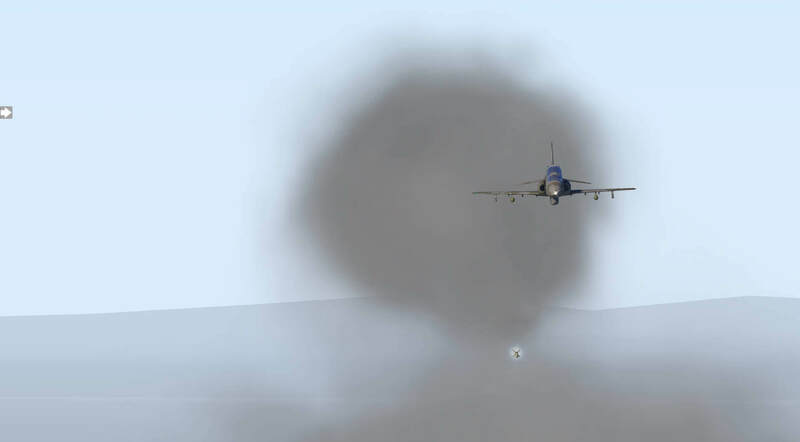 The volume of exterior noises changes whether experienced from inside or outside the aircraft, or with the canopy opened or closed, and sudden manoeuvres create wind noise on the aircraft. 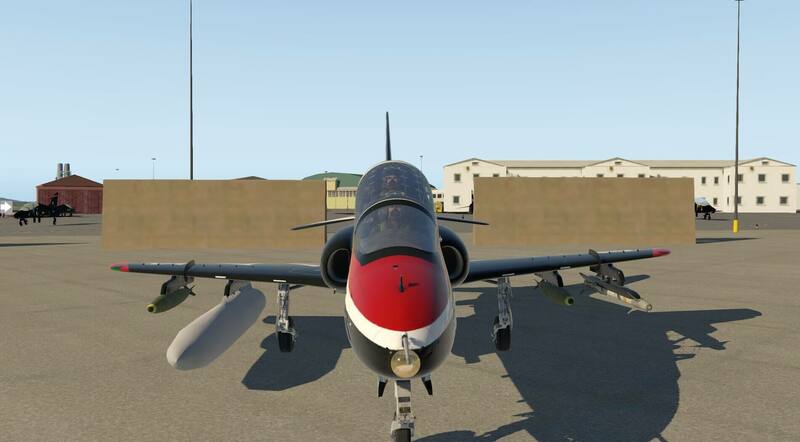 This model does not have all the sounds that some others do, such as undercarriage moving up and down, weapon release and control surface movement but the package that is provided gives the user the feeling of being in a modern jet aircraft with the engine noise and the whine of the systems and allows the pilot to become even more involved with the flight. The sales information mentions the directional quality of the sounds and this is certainly the case with the stereo effect creating a 3D environment. 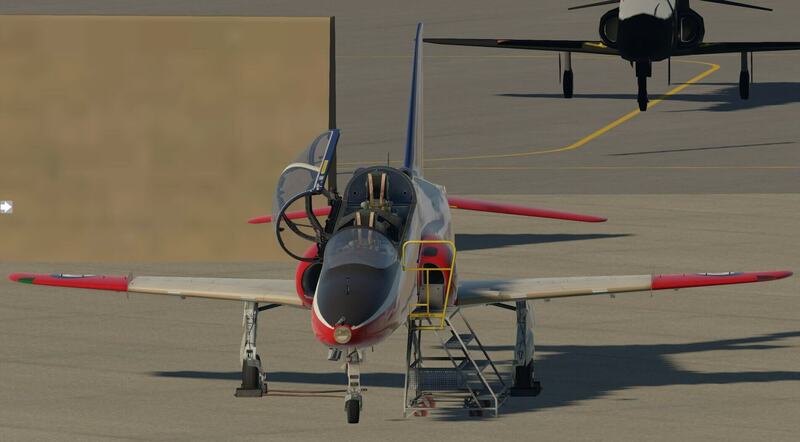 The mixture of the sound package can be adjusted through the X-plane settings window using the sound tab. The model is great to just jump in to and fly. 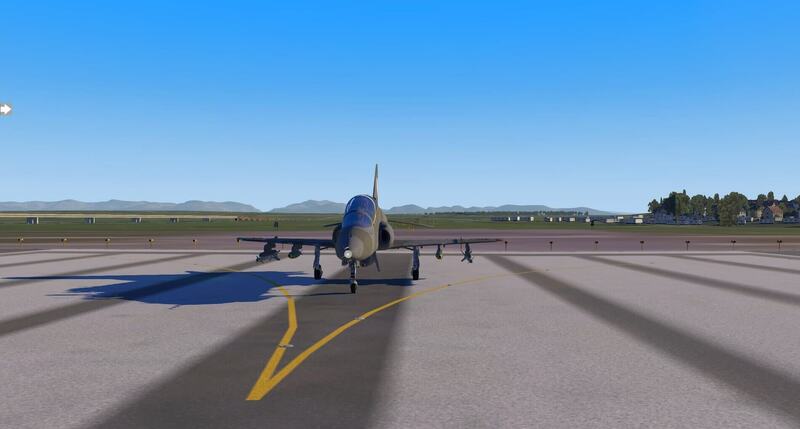 It is very responsive and quite gentle with the pilot, compared to some aircraft, in keeping with its primary role as an advanced trainer. Views from the cockpit are very good and all instrumentation is easily viewed, especially with help from the useful manual. The aircraft handles well on the ground and is smooth in its responses to command inputs. 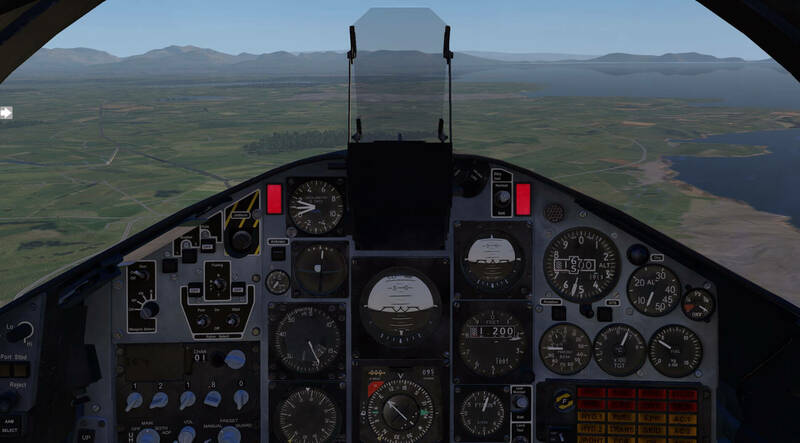 I took off using the minimum of systems, flaps and undercarriage, and continued the flight without having to change much else other than throttle inputs. 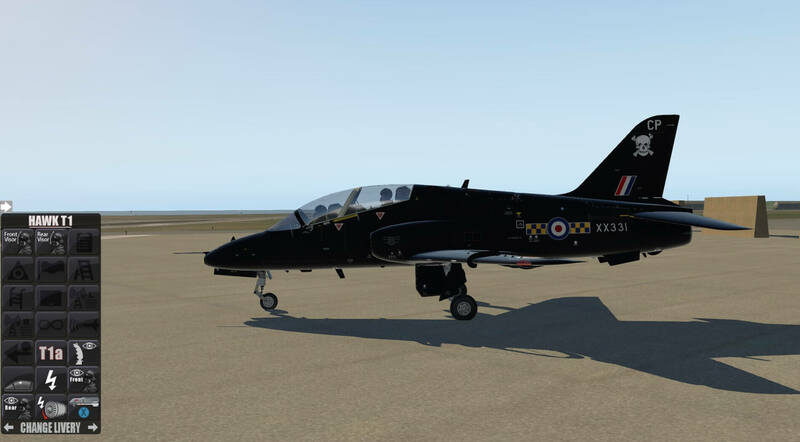 The aircraft handles well and looks very good in the air in any of the liveries provided. 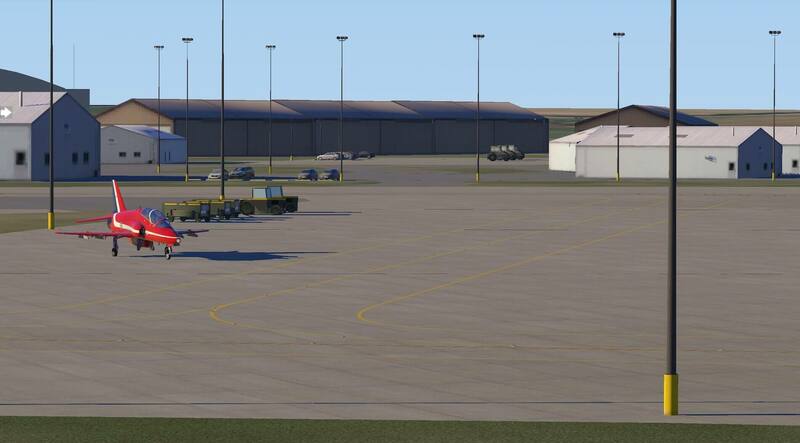 I loaded the weapons pylons using the aircraft configuration page in X-Plane. The pylons are numbered 1 to 4 for the wing pylons and position 5 is the central fuselage pylon. The aircraft looks impressive in the air, with or without its weapons attached and the light, shadows and reflections work very well. The standard of detail and the presentation of the model remains high when in flight. The manual gives good guidance on setting up the weapons to fire and the weapons animation is very good and realistic. 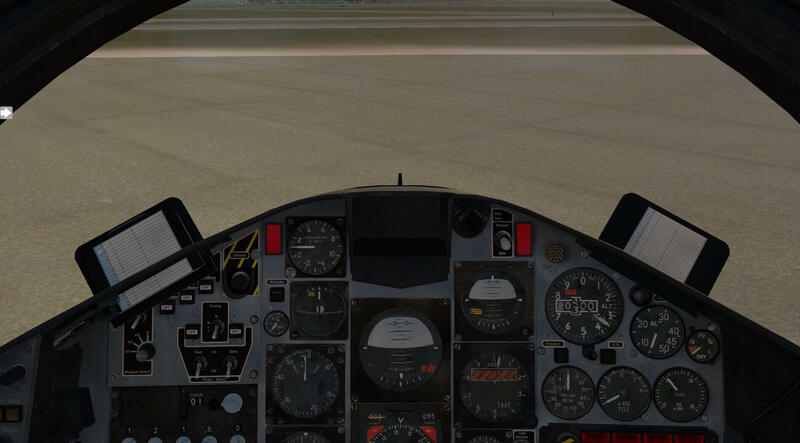 The HUD can be put in place using the selector panel and the cross hairs can be set up to fire the different weapons with different settings through the cockpit panel. The selector panel also allows a short cut to set the weapons to live although this can be done through the proper procedures outlined in the manual. 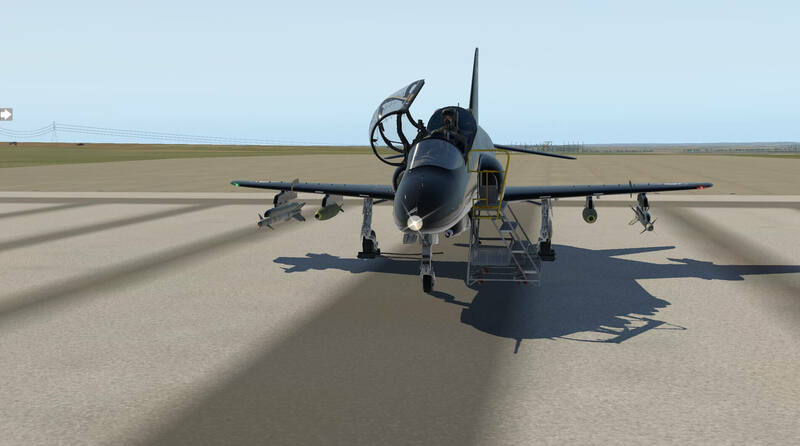 A great aircraft for those who want to be able to download and fly immediately with the addition of weapons systems adding further interest to the flight. 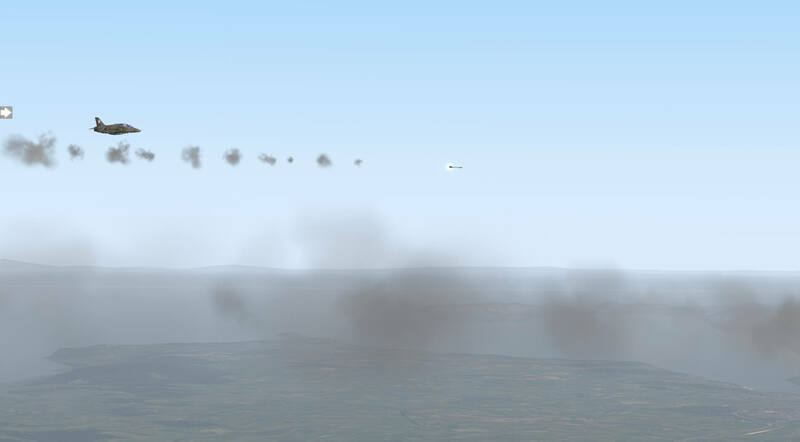 As on most occasions the most challenging part of the initial flight was the landing and I took several attempts, having to reload at three miles out, to carry out a smooth landing. I usually came in too high and too fast and then, almost inevitably, I overcompensated. Once I had managed a smooth landing once I was able to repeat it. The landing is obviously not an essential part of a flight when the intention is to jump in and fly but to make it back to the runway safely is always a sense of achievement. 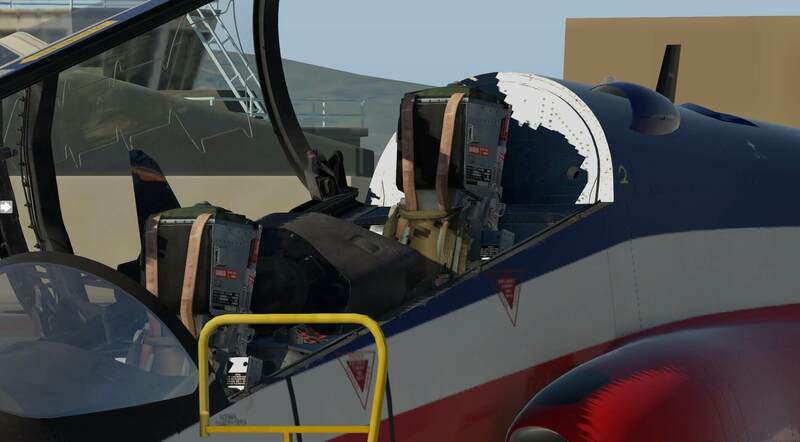 I also established after the main flight that pulling the eject handle in the cockpit does create an ejection from the aircraft. The manual takes the user through an initial flight from cold and dark, through take off, flight and landing and I followed this to learn more about the model. 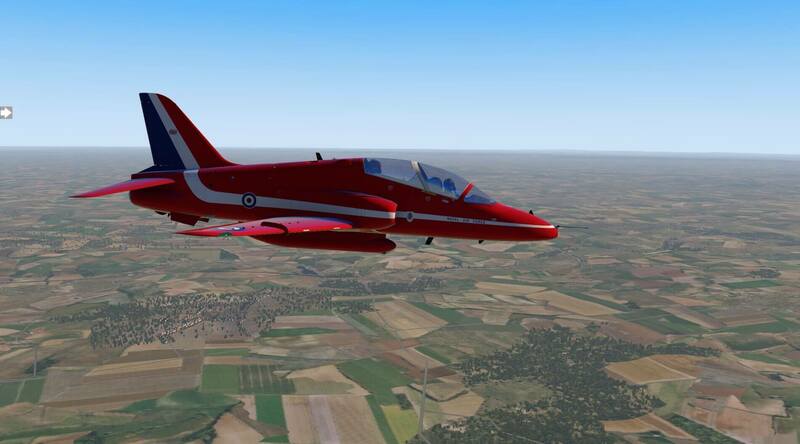 The flight takes the form of a Red Arrows aircraft travelling from RAF Scampton to RAF Fairford for the Royal International Air Tattoo. Having been part of the team at RAF Fairford waiting for the display aircraft it will be interesting to be one of the arrivals. Whilst the panel selector provides short cuts to some actions this tutorial talks the user through the correct actions rather than using those shortcuts. 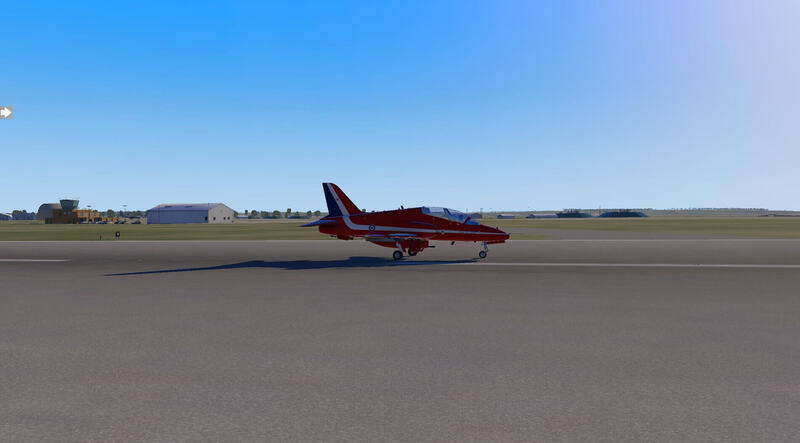 The aircraft is started empty on the apron at Scampton although the tutorial does go through how to open the canopy from the inside using the levers rather than the short cut panel. The aircraft awaited having been set up as dark and cold with the canopy open and the crew steps alongside. Being a display aircraft the weapons panel was not present in the cockpit and the default armament of the central gun was replaced by a diesel oil tank for display smoke via the panel selector. The red, white and blue smoke selector buttons also appeared to the right of the windscreen. Once in the cockpit the first action was to check the parking brake was on, situated to the rear right of the pilots seat. 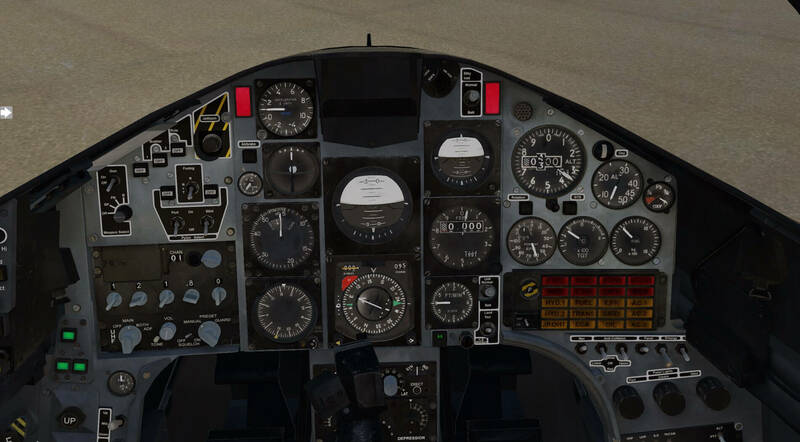 The next stage was to check the avionics were off and the fuel and throttle were set correctly. This is explained in the tutorial notes and the cockpit diagrams are very good in supporting the instructions. The next stage was to switch on the aircraft batteries and check fuel levels. The switches are accompanied by appropriate sounds and the fuel gauge is easy to locate and to read. If the fuel level does not appear adequate it can be adjusted through the X-Plane aircraft configuration screen. The next stage was for the ground crew to remove the chocks and warning flags and make sure there was an external check of the aircraft to confirm this. Once this was complete the radio and IFF equipment was set. Again this is demonstrated in the tutorial with screen shots and explanation as to why certain actions are taken. 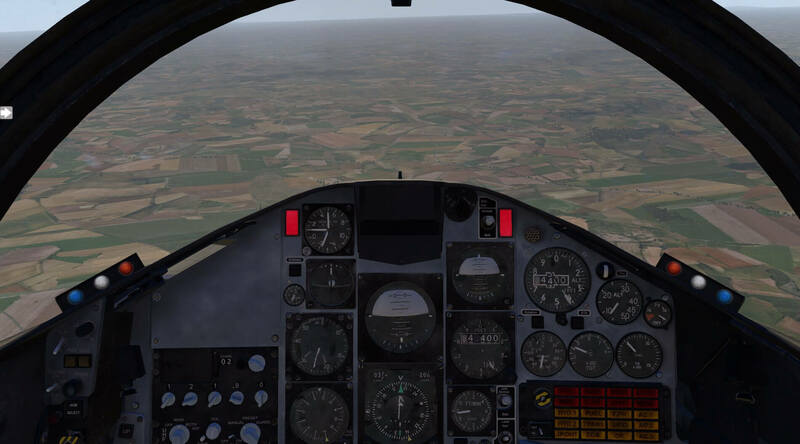 I set the navigation frequency via the appropriate TACAN input for the frequency of Daventry VOR/DME, a waypoint on the journey, and set the course on the HSI to the correct setting from RAF Waddington which would be the aircrafts position after take off. Having completed these preparations it was time for engine start, but first the canopy had to be closed and secured and the crew steps removed. Once this was done I moved the engine start switch to the start position. 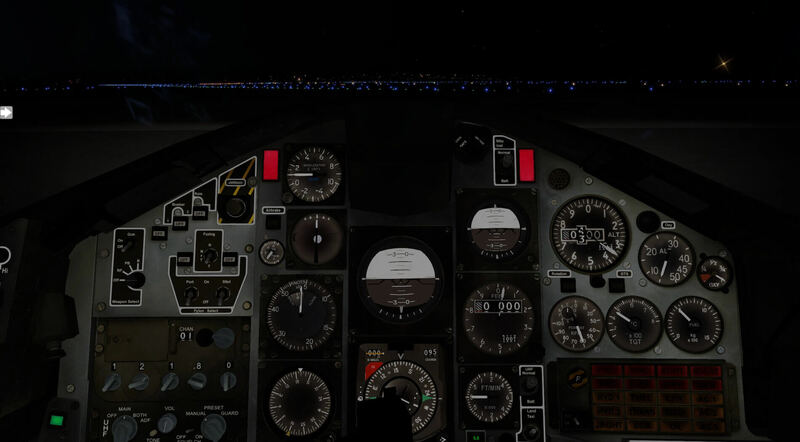 I moved the ignition and fuel switches to the correct settings and switched the aircraft lights on. These operations were accompanied by appropriate switch sounds. The manual takes the user through the engine start process and advises on checks to be made and appropriate instrument readings. The engine sounds as it starts, winds up and reaches correct rotation are very good and convincing. 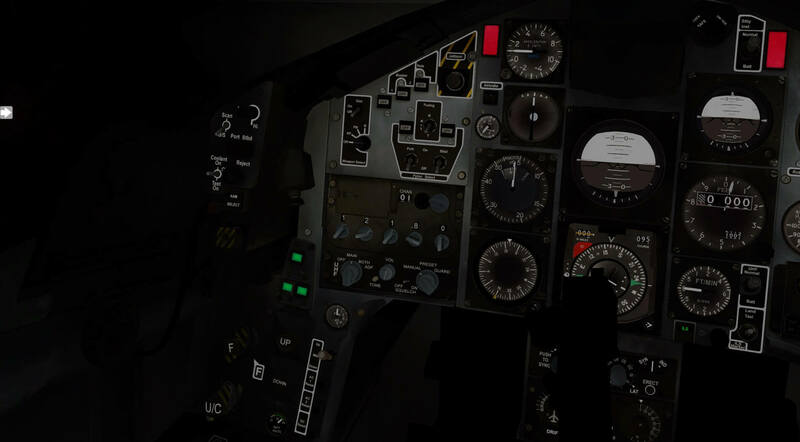 Once the engine is started the sounds are very realistic and the user is immersed in the cockpit environment. 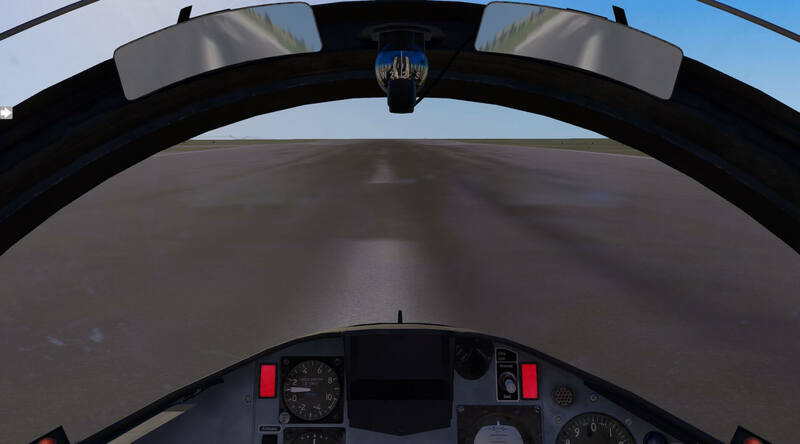 Having achieved engine start I checked the instruments and controls and taxied the aircraft to the threshold of runway 22. During the taxi the attention to detail was again apparent as even the canopy detonation chords cast a shadow. 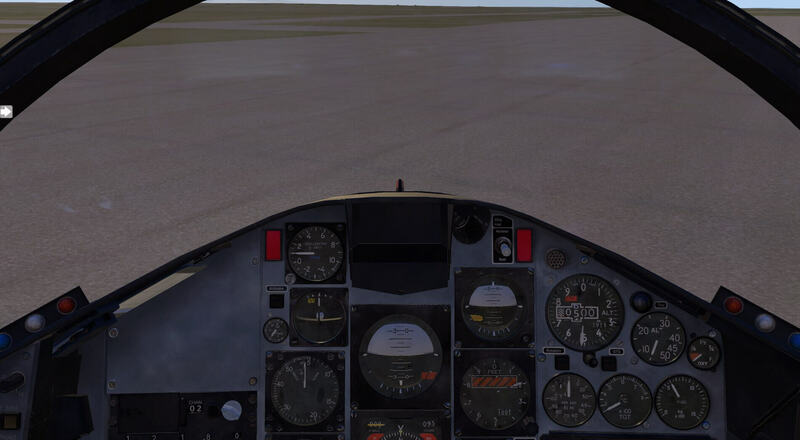 Once at the threshold I checked all was clear before entering the runway for take off. The instructions in the manual for take off cover the correct take off and climb speeds and also the best altitudes for flight. Following the directions for VFR navigation and also using the VORs on route, with the TACAN, was straight forward and the flight was really enjoyable. The aircraft is responsive and smooth and reacts quickly to any inputs. The use of the TACAN frequencies made the flight really interesting and using a map from Goodway (or X-Plane or Little Navmap for example) helped to visualise the route and directions and assisted with VFR flying. 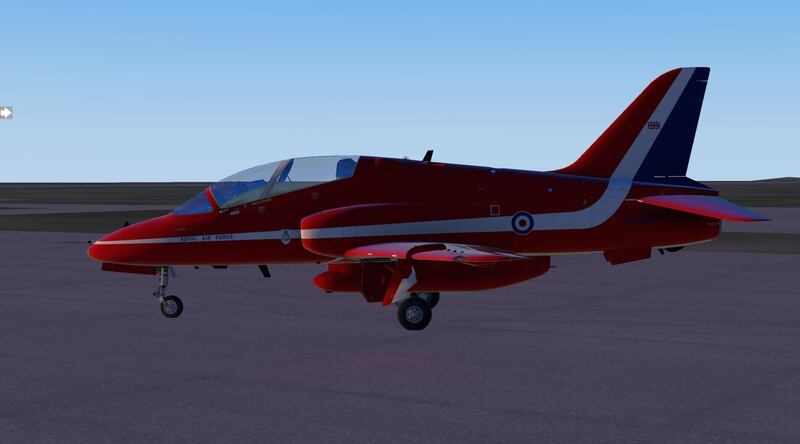 The sales information states the aircraft is Goodway compatible and as the aircraft is not modelled with an FMS, which would receive a Goodway flight plan, I enquired of the developers how the two are best used together. 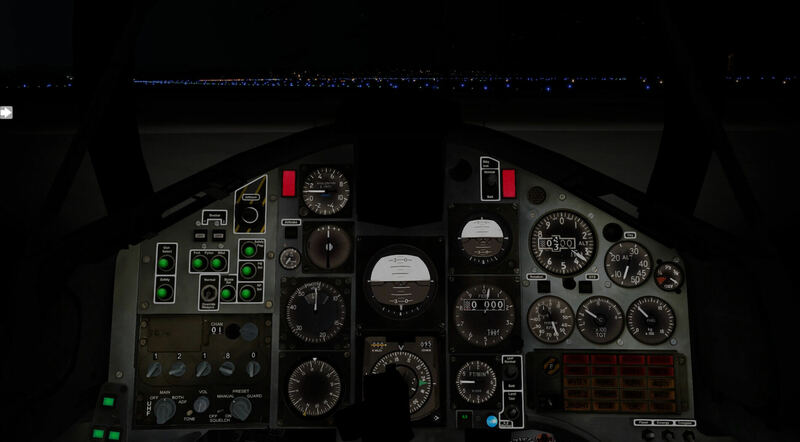 One issue that arose was that there is a small switch on the centre front panel that can be toggled between ILS and TACAN, and for this flight it needed to be set for the latter. 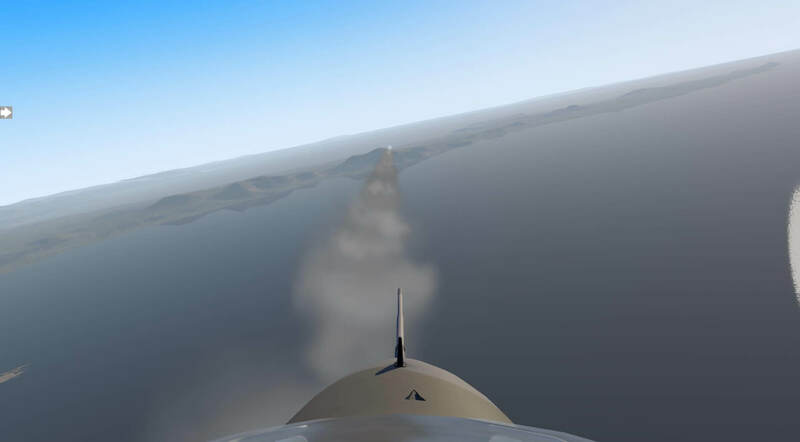 Visibility from the front and rear cockpit is great and enabled me to enjoy the scenery at all altitudes. Prior to the flight I programmed a joystick button to the “toggle smoke puffing” command. 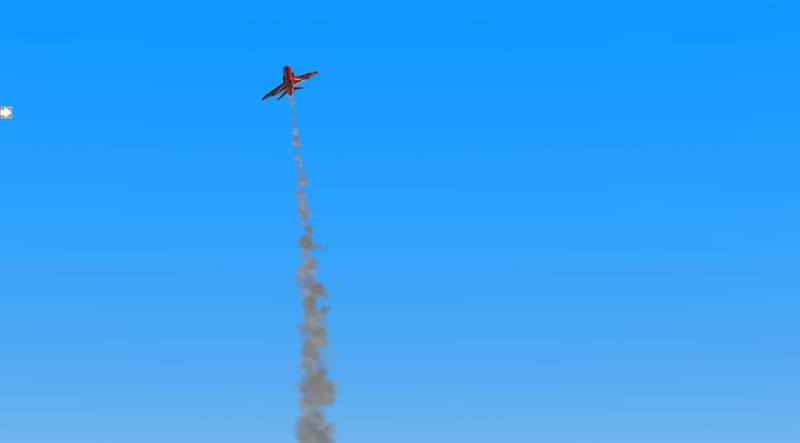 This worked well with the Red Arrows model and created the effect we see at airshows. At the end of the trip the manual explained how to line up with runway 27 at Fairford and it was back to the landing challenge. I achieved this although I am glad the RIAT crowds were not watching as it certainly was not as impressive as the real Red Arrows and I need further practice. I turned right off the run way and taxied back via the northern taxiway as during the airshow the southern taxiway is not used. I passed the technical area of the airfield and parked in the northern loop. I followed the directions of the manual switching off lights, fuel, engines and electrical power, ground crew attended with warning flags and chocks and I was ready to leave the aircraft. This flight was a great experience. The guidance from the manual made it more than just a fun flight but was not so challenging that I could not follow the instructions. 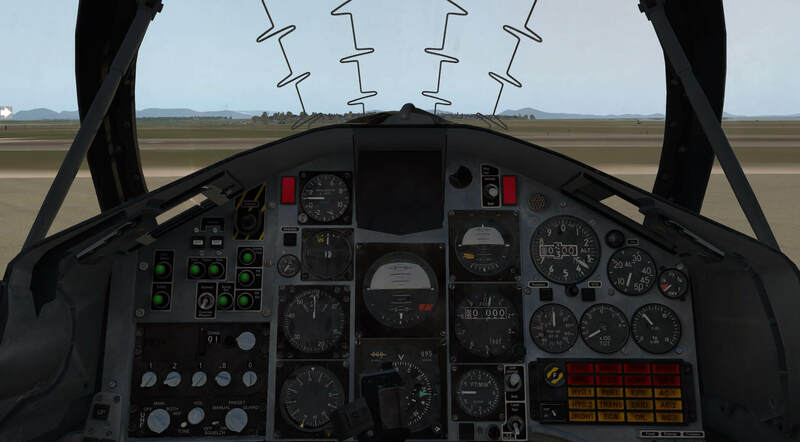 The aircraft is straight forward, though not necessarily easy, to fly and the detail inside the cockpit makes reading and using instrumentation easy to do. The selector panel allows short cuts to some procedures, if preferred, and the interactive checklist involves the user to a greater extent. The fact that the manual goes in to each system in depth, and also how to deal with failures, I feel even more challenges ahead though this is highly tempting given the immersive experience provided. A great model to fly. 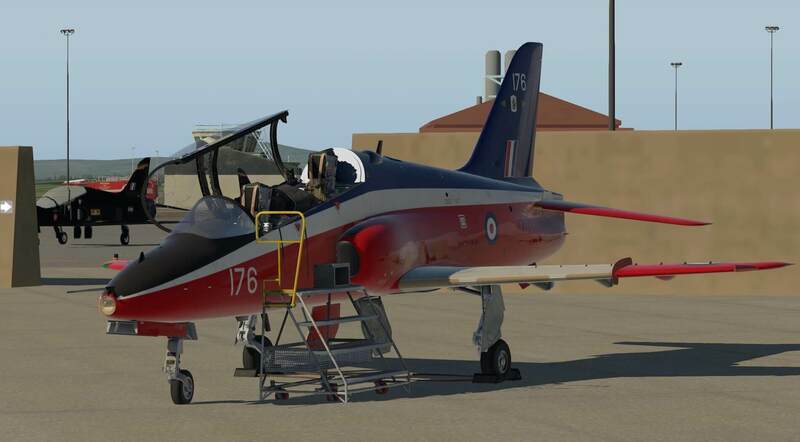 This model looks good as soon as it is loaded and the detail immediately impresses whether inside or out of the aircraft. 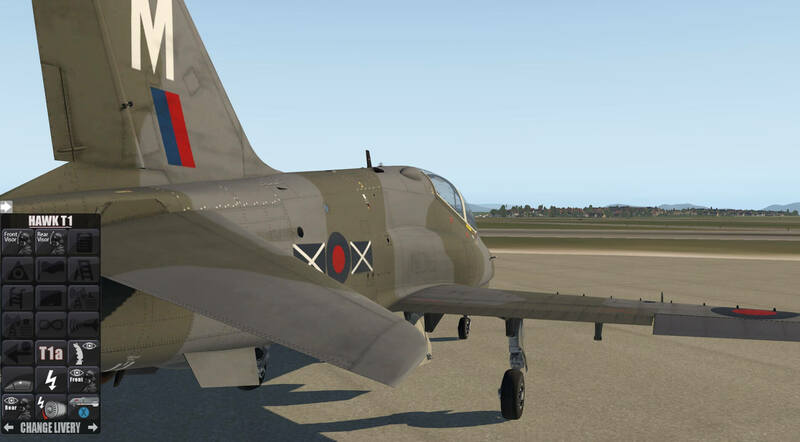 The large variation in liveries allows the user to use aircraft covering differing squadrons, roles and countries and the weathering and wear marks also bring the model to life. Inside the instrumentation is clear and legible from any distance and the fact that they are easy to read makes flying easier. 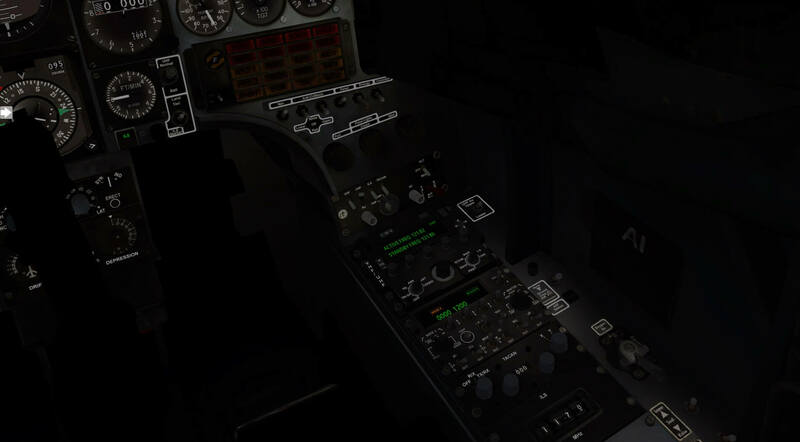 The on-screen panel selector allows the model to be changed and adapted to suit the user and the role required and also provides access to short cuts such as cold and dark or engines on. 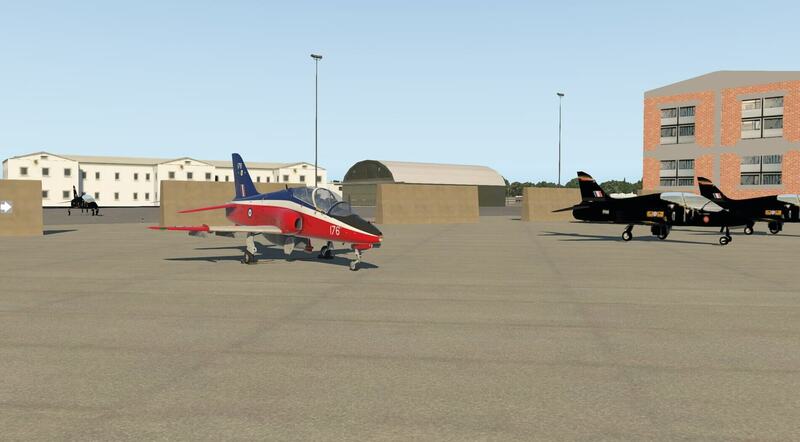 The combination of these mean that the aircraft can be used for a full flight, particular sections of a flight or simply to fly for enjoyment. The in-depth handbook, explanation of systems and the fact that the majority of instruments and controls are made to work means that the pilot can become more and more involved in the flight and carry out any sortie to a considerable depth. In flight the model is responsive and great, though not easy, to fly. 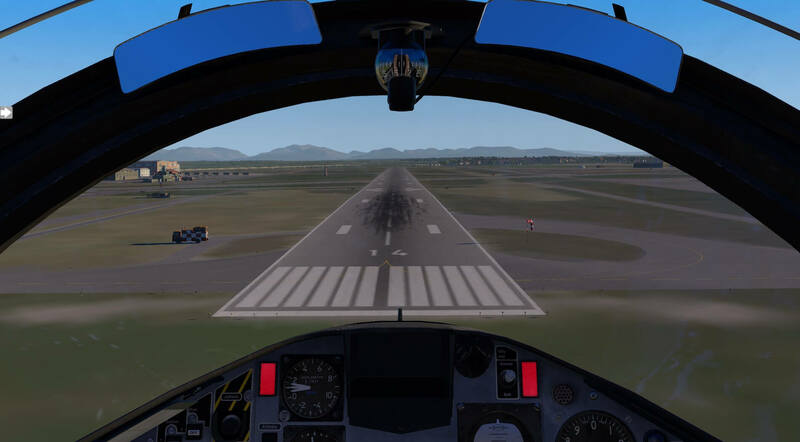 Visibility from the aircraft is good and mistakes are forgiven to some extent, in keeping with the role as an advanced trainer. 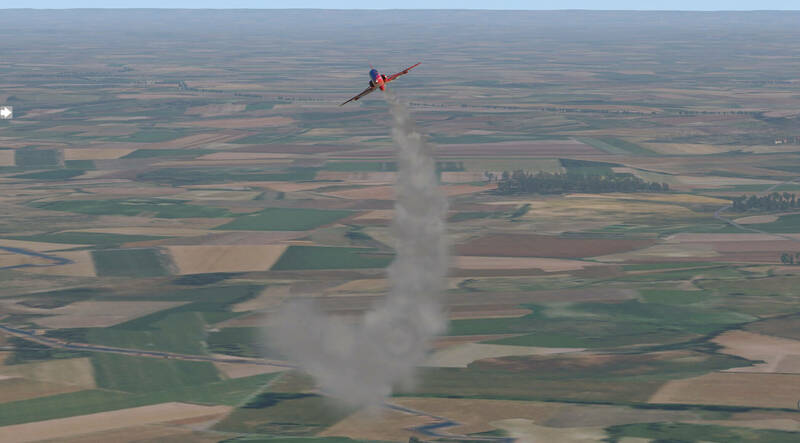 The model integrates very well with X-Plane scenery and other default functions such as weapons and display smoke so flights can be extended even further. This is a great model, highly detailed and very immersive. It draws you in to greater and greater challenges and the fact that these can be achieved with practice means the aircraft delivers on many levels. 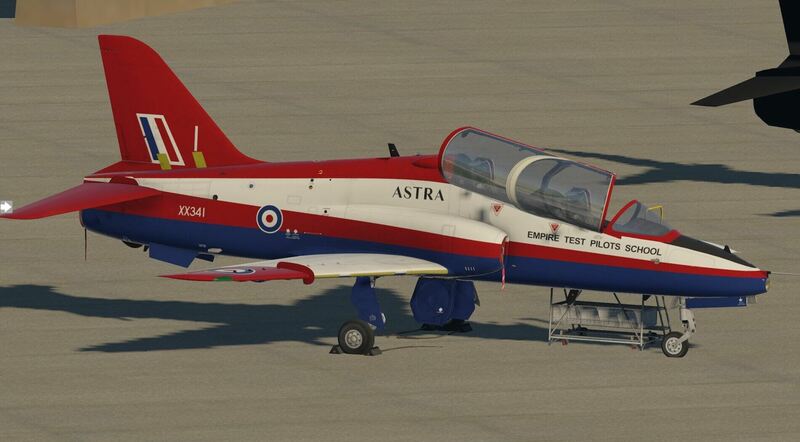 As of this writing, November 18th, the Just Flight / Thandra Design Hawk cost you 44.99 USD. 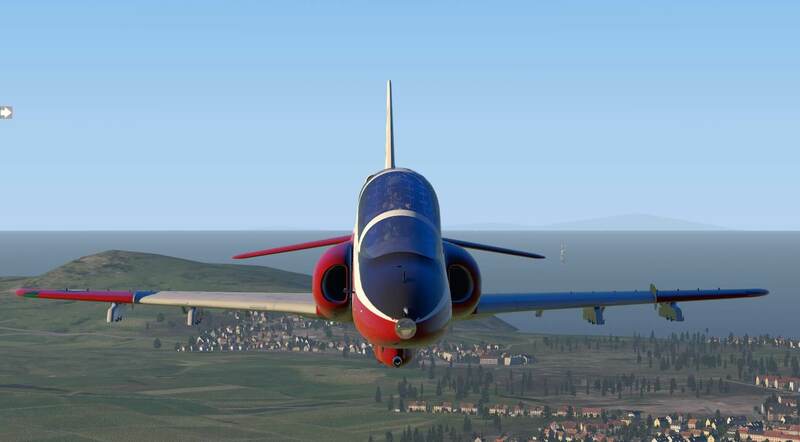 More information can be found at the dedicated X-Plane.Org store page.